It’s only a few days until Mac & Cheese Night #4, and I’m just now getting the write-up done for Night #3—it’s been that sort of month, y’all. You’d think I’d be tiring of all that pasta, cheese, and sauce by now, but frankly, I want more comfort food bliss. 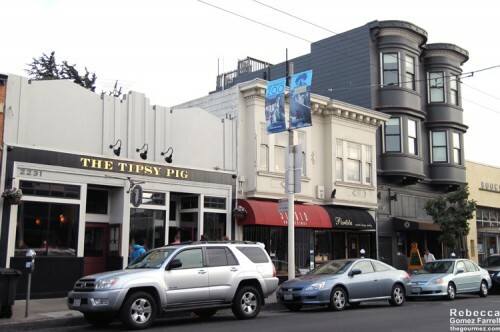 Night #3 was our biggest group yet, and it took place at the Inner Marina’s local gastropub, the Tipsy Pig. 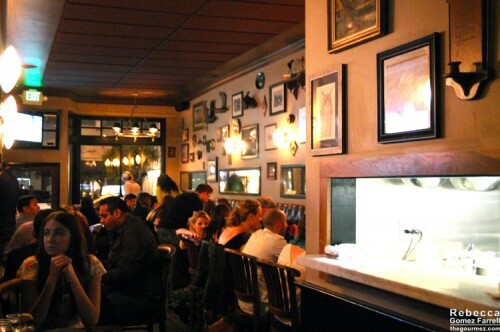 This is definitely an in-demand spot, but unlike so many others of its ilk, the Tipsy Pig actually takes reservations and has thus earned my gratitude. I’m so much happier when I can be assured I’ll get a table before I go to a restaurant, especially when that involves trekking across the Bay, as it often does. 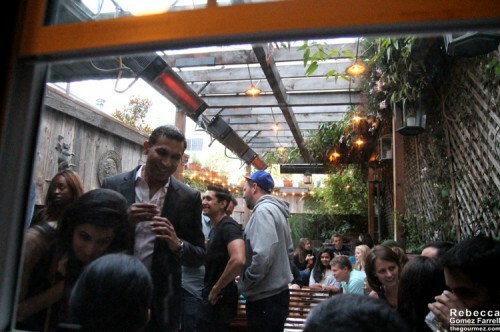 The overall feel of the place is kitschy English pub…with a backyard full of frat boys. 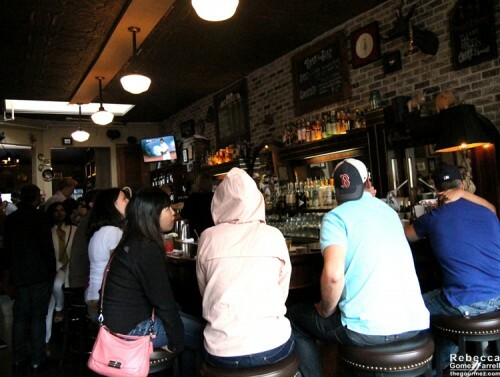 The crowd around the bar. I found it cozy, and of course, the company was good. Menu focus is subtly playful takes on standard menu items at most American pubs these days: tartare, ribs, sliders, risotto, burgers, and of course, mac & cheese. Some of my companions found those takes too subtle, but that does not apply to the mac & cheese. Let’s start there, shall we? 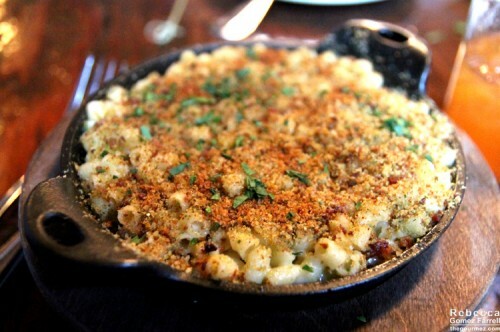 The Tipsy Pig’s mac & cheese revels in the complement of bacon, from the crumbles mixed in to the cheese sauce cooked in bacon fat. Cheese: Blue cheese, gouda, and white cheddar. It needed a higher proportion of blue cheese to stand up to all that bacon. Creamy vs. Stringy: Definitely creamy, with a whole lot of bacon flavor infused into it. Noodles: Ditalini or tubetti, otherwise known as small tube pasta normally seen in soup. Cooked slightly past al dente, they worked great in this dish—I’m remembering that for my own recipes. Breadcrumbs: Fine crumbs sprinkled on top along with parsley. Grease: The dish had a good sheen of grease but no icky puddles of it. Verdict: Bacon! It was the first thing we all smelled and our first thought on tasting it. Crisp, hefty bacon bits were also stirred into the dish, and shall I remind you of the sauce cooked in bacon fat? I’m not going to lie; all that made it an amazing plate of mac & cheese, my favorite yet. I just wish the cheeses’ flavors came through stronger. While my companions tried a variety of the Tipsy Pig’s small plates and entrees, I focused solely on the mac & cheese…and the English Fashion ($10). The cocktail’s made with Bulleit bourbon, apricot-riesling jam made in house, bitters, brandied cherries, and soda water. And it was not up to snuff for my liquor tooth. There was far too much soda for my liking, making everything in the glass but the bitters taste diluted. Make sure you mix it really well to get the jam stirred in, which had more riesling than apricot notes. 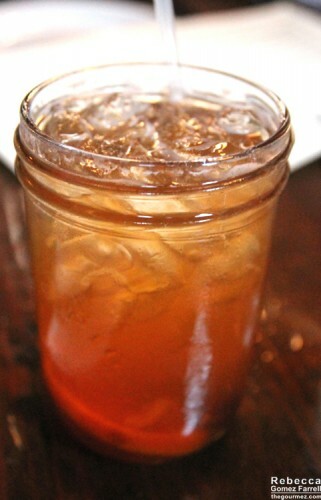 Even after the stir, though, you’ll be hard pressed to taste the bourbon. 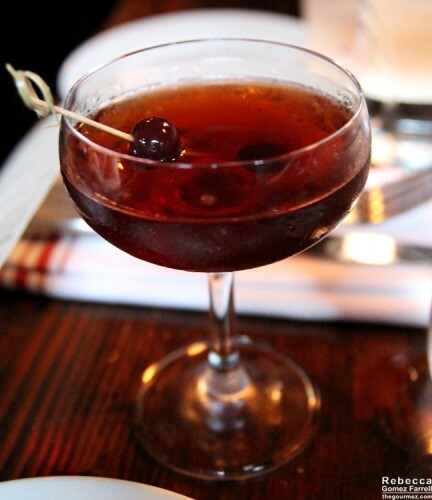 My friend’s manhattan, called the Pig Manhattan ($12), was a better choice with Four Roses Single Barrel bourbon, Vya sweet vermouth, bitters, and more brandied cherries. 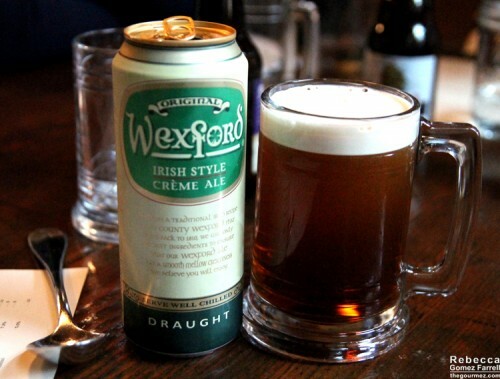 Our beer-drinking companions were pleased the Tipsy Pig offered an essential beer selection and some rarer imports like Wexford Crème Ale. 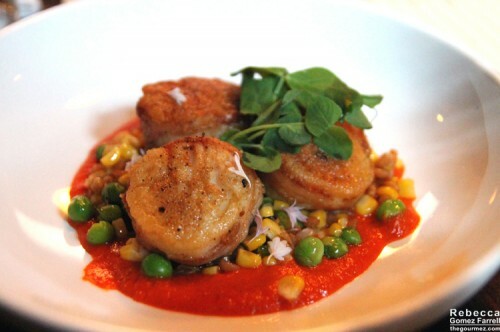 We all found the beautifully seared scallops over succotash quite tasty (okay, I also had bites of the small plates. I am weak.). Though it smelled strongly of the sea, the taste of it was all velvety scallop with bacon lending salt. 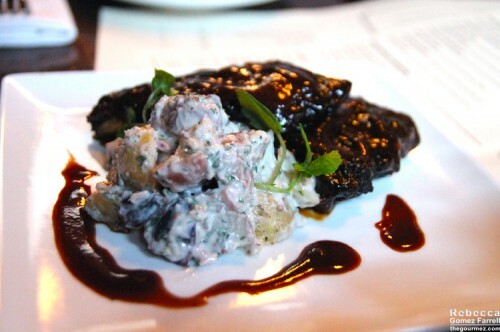 Another favorite was the baby back ribs with a salad of mixed potato varieties. It’s prescient that the salad is in focus in that picture, because everyone loved it. They actually wouldn’t shut up about it. The style is German: warm with a light, creamy dressing, a hit of vinegar, and plenty of….you guessed it! Bacon! The ribs were nice and spicy but the sauce veered too close to ketchup. 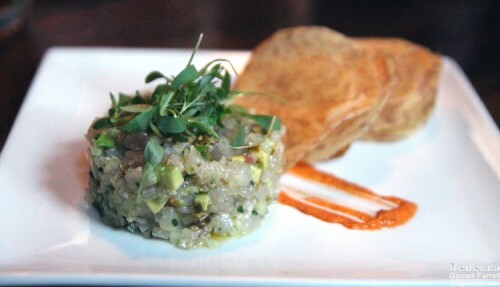 The yellowtail tuna tartare itself was good, though on the bland side. It’s served up with citrus-serrano vinaigrette, avocado, pumpkin seed salsita, and taro root chips. The consensus was that a stronger tasting root vegetable would have served the dish better. 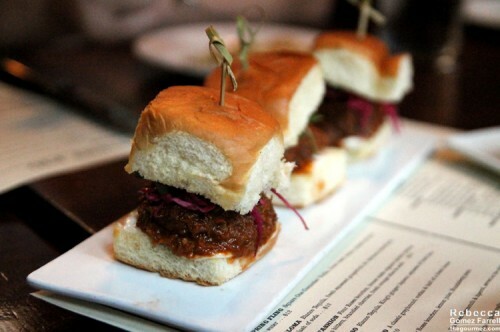 We also had a round of BBQ pork sliders, which were surprisingly close to sloppy joes in flavor despite a sweet vinegar bent. Using sweet Hawaiian bread for the buns was a great idea, but we’d have preferred more compelling and crunchier toppings than the simple red cabbage slaw. 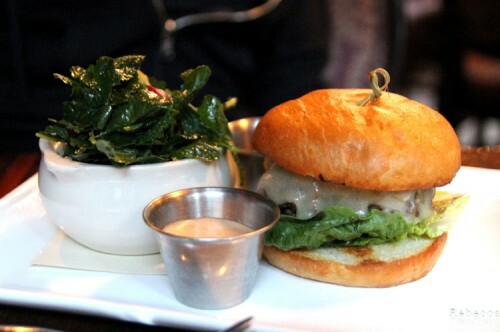 Finally, the Tipsy Pig burger was put to the test by one diner. She thought the cheddar and onion straws were amazing but complained that the bun could not stand up to its filling, a common burger transgression. Overall, she found it too pricey for what it was. I cannot say the same of the mac & cheese. I’d pay $12 for it again in a heartbeat. Though I agree with the table’s conclusion that the Tipsy Pig doesn’t go far enough in seeking bold flavors, I’m rating this restaurant a little higher than they suggested. Plenty of people have heard me rant about how I’m over the bacon craze and its use in, well, everything, but I have to give accolades to the Tipsy Pig for knowing how to wield that star ingredient so well and in multiple ways. Next week? Homeroom in Oakland!